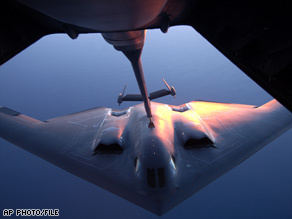 HICKAM AIR FORCE BASE, Hawaii (AP) -- The Air Force said the first crash of a B-2 stealth bomber was caused by moisture in sensors and estimated the loss of the aircraft at $1.4 billion. "It was just by the grace of God that they were safe, and the good [ejection] system," Carpenter said. Carpenter said the pilots and crew followed procedures and "the aircraft actually performed as it was designed. In other words, all the systems were functioning normally." However, a technique learned by some two years ago that had gone widely unknown and unadopted probably would have prevented the crash, Carpenter said. The technique essentially heats the sensors and evaporates any moisture before data calibrations. "This technique was never formalized in a technical order change or captured in 'lessons learned' reports. Hence, only some pilots and some maintenance technicians knew of the suggestion," according to Carpenter's executive summary of the accident. The report said, "The human factor of communicating critical information was a contributing factor to this mishap." The general said his responsibility was solely for the investigation of the crash and added that the report was forwarded to commanding officers to determine whether any disciplinary measures are required. The sensors measure air pressure to help calculate everything from airspeed to altitude. Because of the bad data, flight computers had inaccurate airspeed and wrongly indicated a downward angle, which contributed to an early rotation and uncontrolled 30-degree pitch up. Carpenter said the lack of altitude and airspeed prevented the pilots from correcting the aircraft. Guam, 3,700 miles southwest of Hawaii, is known for its humidity. But the Air Force said water in the sensors never caused any problems. The Spirit was delivered in February 1995 and expected to be in service for another 50 years. The bomber had been returning to Whiteman Air Force Base in Missouri, where the 21-plane fleet is based. The Air Force grounded the B-2s after the crash and resumed flying them in late April. Carpenter said procedures and policies are now in place to guard against similar crashes. "It's fortunate the crew was able to safely eject. It's unfortunate, however, that we lost one of our nation's penetrating bombers," said Gen. Carrol H. Chandler, commander of Pacific Air Forces. 5 Obama: Black or biracial?